The Universal Tournament Arc is what some would label the best part of Dragon Ball Super so far. To me, this arc has been dragging its feet a little too much & has been avoiding any emotional or exciting punches that old tournaments fro. The Dragon Ball series contained. Well, I will say that this episode surely tugged at the heart & left us feeling heavy. The episode kicks off with Master Roshi walking around the somewhat destroyed battlefield observing battles between the fighters from the the different universes. While strolling along, he comes across Caway, an attractive warrior from Universe 4, who attempts to seduce him. However, once she goes in for the final blow, Master Roshi snap out of his seduced state & breaks her weapon. But before Master Roshi can get serious & pay her back for trying to seduce him, she takes the initiative & jumps out of the ring, fearing that Master Roshi will make her his undesirable wife. Once Master Roshi calmed down, he called out Dercori, who was watching him from the shadows. Decori is a talisman-wielding warrior from Universe 4. Master Roshi told Decori that he also ibseved her fighting style to which she explained that he only witnessed a piece of her illusion tactics. You see, her talisman contains 76 attacks & 129 illusion s, which she displayed right away by making Master Roshi think h was about to fall out of the ring. Decori also transformed into a giant version of herself that gave Roshi a run for his money. Not only was she using the illusions in the talisman to confuse Master Roshi, she also uses the darkness of the dimension they are fighting in to her advantage. When Master Roshi landed after being hit by her attack, he was unable to move because she used the shadows to disable his movement; think Shikamaru’s jutsu. Just when it looked as though it was all over for Master Roshi, he used the familiar & deadly Evil Containment Wave to seal her in a small bottle & toss her out of the fighting ring. 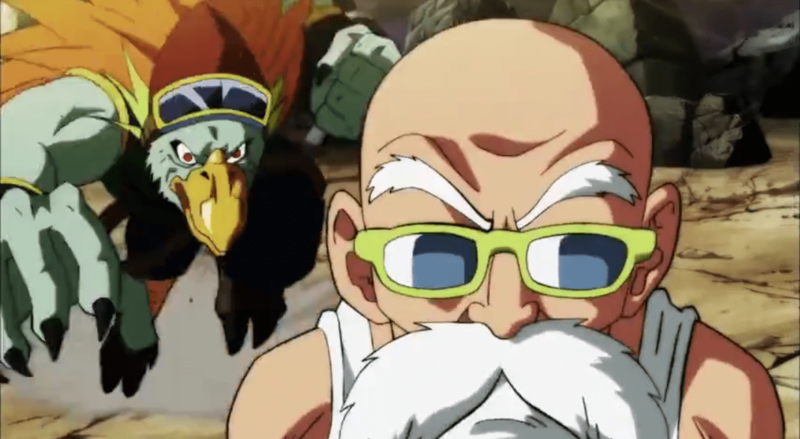 Master Roshi definitely became a Target of Universe 4, because right after defeating Decori, Ganos came & challenged him for defeating two of his friends. Although Ganos transformed into a bird-like creature & gained strength & speed, Master Roshi, being the strategic fighter he is, was still able to maneuver his way out of Ganos’ attacks & ultimately bring him down a not. However, this didn’t last long & Ganos began growing stronger & faster, while hammering away at Master Roshi with a string of direct hits. Master Roshi even tried to hypnotize him but it failed, because Ganos snapped himself out of the hypnosis by electricuting himself. Master Roshi stood up again & in an emotional & powerful scene, he said his farewells to Krillin & Goku, & he fired off his most powerful Kamehameha, which sent Ganos out of the ring. Being that he was already worn out by Ganos’ attacks & used a powerful version of the Kamehameha, Master Roshi died on the field, which caused Goku to break away from the opponent he was fighting & rush to his master’s aid. Goku tried desperately to bring Master Roshi back to life & when it looked as though all hope was lost, he brought Roshi back to life with one final burst of his Super Saiyan Blue energy. After wiping away his tears, Goku helped Master Roshi back on his feet & the two headed back to the battle. Not only was the episode very powerful & emotional, it didn’t waver from focusing on Master Roshi’s battles. Unlike episode 103 whose title alluded to Gohan going wild on some opponents, this episode made me care more about Master Roshi’s character than I did with Gohan’s. You can feel Roshi’s will to grow stronger & his never give up attitude throughout this episode, which left me thoroughly enjoying this episode. So far, I would have to say that this is the best episode I’ve seen from this arc.